Platelet Rich Plasma, or PRP, is a substance made from your own blood to trigger rapid healing. Platelet Rich Plasma Therapy is a relatively simple, non-surgical treatment used aesthetically to stimulate collagen, repair all scars, resurface stretch marks, and rejuvenate hair growth. It merges cutting-edge technology with the body’s natural ability to heal itself. Platelets growth hormones and cytokines tell the tissues to increase rebuilding of tissues to enhance healing. 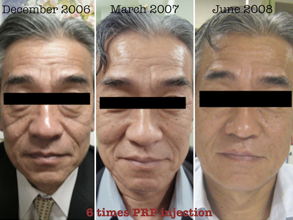 When PRP is used aesthetically, it stimulates a mild inflammatory response, which triggers the healing cascade. This leads to restored blood flow, new cell growth, and tissue regeneration. Because the blood is your own, there is no risk of rejection or acquiring blood borne diseases such as HIV or hepatitis. A sample of blood will be taken from a vein in your arm under sterile conditions. The blood will be placed in a specialized centrifuge, which is a device that spins the blood. This separates the blood cells from plasma, and allows concentration of the platelets. The process increases the concentration of platelets, which contain the healing growth factors, from the normal 6% to 94%. Preparation time is about 15 minutes. The finished PRP product is then available for use in various ways. It may be used as an injectable in the face for rapid, lasting wrinkle minimization by promoting collagen stimulation for anti-aging, or into the scalp for the return and thickening of fallen hair, or into scars on any part of the body and into stretch marks to heal, resurface and repair. PRP may be used as an injection only, applied topically and pushed into the skin with Dermapen only or by using both injections and Dermapen together for the fastest, most visible result. Call us to schedule a complimentary consultation and let us show you how PRP may be just the treatment you seek to attain younger looking skin, revision of scars and stretch marks or the return of hair loss. Cost – Injections $750-$1000. Dermapen $700.